It happens every year in Wisconsin. A snow storm is brewing (or seemingly shows up out of nowhere), and you have a decision to make: Do I close the office? The industry you are in, the customers or clients you serve, your company’s size, and your location likely dictate that decision. Whether to close up for the day due to inclement weather (or for any other reason) is a business decision. You may have a policy in place already that determines when to close, or you may make a game-time decision as you intently watch the radar in the wee hours of the morning. Must I pay my employees? Do I allow my employees to work from home? Can I make my employees work from home? Should I allow my employees to come in if they want to do so? All of these scenarios are possible, depending on the industry and the jobs each employee performs. Various factors may be at play. For example, can some employees work remotely while others really cannot, given their job duties?. Thinking these factors through, before inclement weather arrives (or, before it arrives the next time), and having a policy in place and ready to apply can save some later headaches. When applying an inclement weather policy, several points should be addressed, including the following. If your employee works, you must pay them for the time worked, regardless of the location from which the employee performs the work or whether your business is officially “closed”. 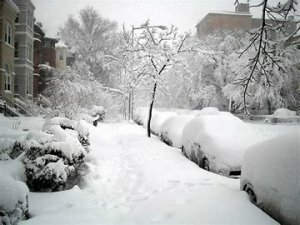 You have a policy that provides pay for closings due to inclement weather. This can be distinguished from allowing an employee to not come to work due to weather when, for example, the employee drives from a distance/location making the commute treacherous, but you have not decided to close for the day. Your policy should address both situations distinctly. Your employee has paid time off (PTO) or personal time that you allow (again, per your policy) the employee to use, so she will not lose pay on the day of the inclement weather closing. If you close, and don’t allow your employees to work at all (to come in or telecommute), and you don’t already have a policy providing for paid weather days, and your employee does not have PTO to use, what then? Can you simply decide to close and your employee is out of pay for that day? Generally, yes. Again, this is subject to the salaried exempt classification mentioned above. In the vast majority of employment situations, absent a contract that provides to the contrary, employment is at-will. In other words, the employee is employed at the will of the employer (and the employee). Part of that will includes an employer’s right to set the terms and conditions of employment. There are many laws setting limits on the terms and conditions an employer can set – like minimum wage and overtime laws. However, employers are generally not required, in an at-will employment situation, to give employees a minimum number of paid hours, regardless of the employee’s normal schedule. Of course, it is possible to have a contract for employment that guarantees a certain number of hours of work each week for an employee, with the employment still being at will, but this situation is a bit outside the realm of this blog article. If this seems unfair, then it is easy to understand why many employers have a policy that provides pay to employees in the case of inclement weather closings. If you don’t have an inclement weather policy at all, now is a good time to consider implementing one, before the next Wisconsin winter storm hits. For more information regarding employment policies, or any questions regarding employment law, contact Jessica M. Kramer or Leslie B. Elkins at Kramer, Elkins & Watt, LLC.